A lot of personal firsts for players came out of Pro Tour Fate Reforged, including Spain's first PT winner, Antonio Del Moral León. Congratulations, Antonio! Check out the full coverage for that story and all the others! So, yes, this Arcana was inspired by the Pro Tour. 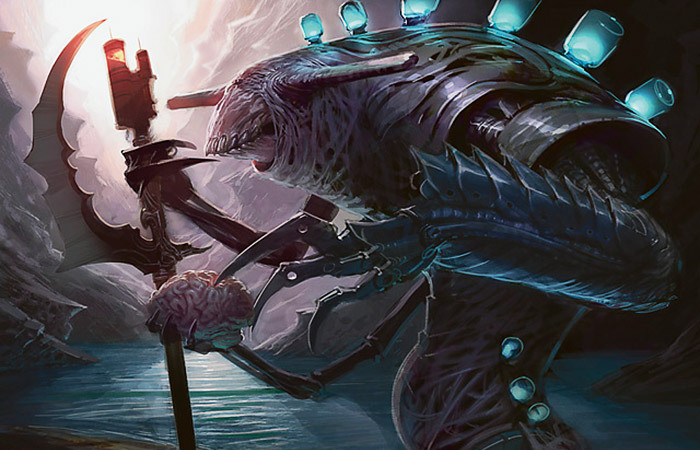 Action: This is one of five Phyrexian "exarchs," which are like lieutenants to the Phyrexian leaders. This one should be more blue-aligned, so give it elements of bluish chrome. Maybe this one has neural tissue suspended in 2-3 "jars" that are attached to its spine, like the "jar skites." Its staff ends in some sort of chrome surgical device or needle mechanism. 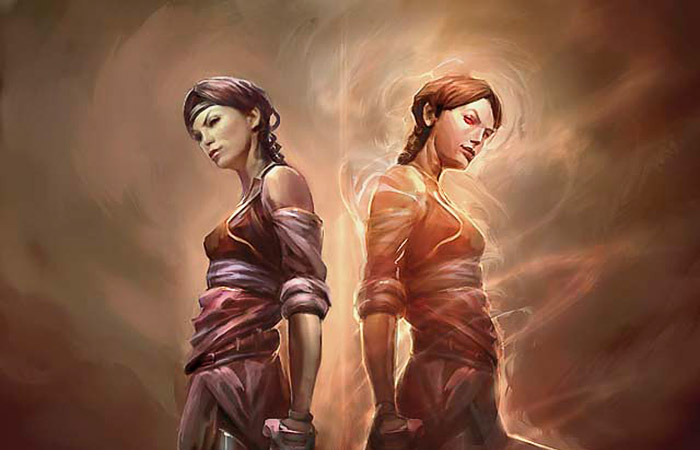 Action: We'd like to see a "mirror" composition of a human female adventurer and her twin. One version of the adventurer is all business, but the twin has a red glint in her eye and looks like she intends to make some trouble. In reality the twin is a temporary creation of magic, so if you want to show the twin as semitransparent or sparkling somehow, for example, that would be fine. Mood: As though her suppressed emotions took on a life of their own. 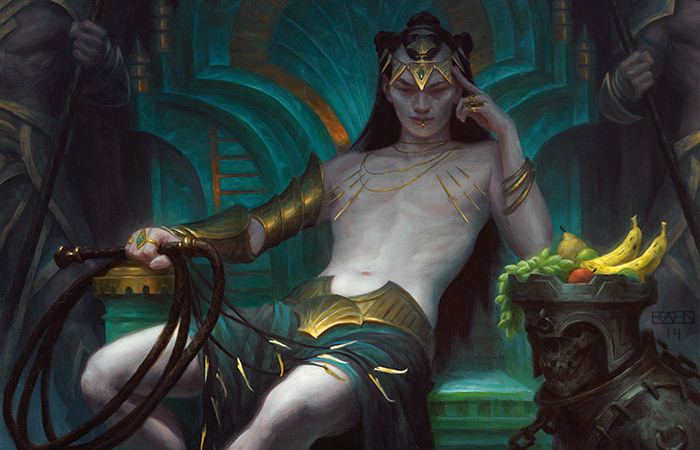 Action: Show the legendary leader of the Sultai, Tasigur. He is the inheritor of the vast Sultai fortune. He is only 15 or 16 years old and has been coddled, pampered and flattered, resulting in him being a cruel and unfeeling ruler. He's a pale, slender youth, often wearing elaborate jewelry and adornments—thin gold chains, gold rings, etc.—some of these adornments he pierces into his flesh. His favorite weapon is a long whip that is tipped with small, silver razors which he uses on those who displease him or when he's bored and desires a bit of bloody playtime. He is usually carried about the Sultai palace on an ornate platform borne by zombies. Rarely are his feet allowed to touch the floor, rather zombies lay before him like an undead carpet as he walks along their bodies. Show him looking cruel and disdainful at the camera, daring us to displease him. Mood: The worst kind of royal. You want to strangle him but he's too well protected.